Most of the principal cast of Star Wars: Episode VII has already been announced, but we knew there was at least one more major lead female role left to be filled, and maybe some other supporting roles as well. Now two more names have been officially revealed with Lucasfilm announcing on StarWars.com the addition of Academy Award winning 12 Years a Slave star Lupita Nyong'o and "Game of Thrones" fan favorite regular Gwendoline Christie. But as you might expect, we have no details on what characters these two actresses might be playing in the film from director J.J. Abrams that is currently in production. Nyong'o was named as taking a meeting for Star Wars a few weeks before she won the Oscar for Best Supporting Actress, and that meeting apparently went well enough to land a role in the film. Rumors have pegged the role as being a descendant of Obi-Wan Kenobi, but it's hard to tell what's true out there with so many rumors swirling. Either way, she's a welcome addition. The same can be said for Christie, who also just landed a role in The Hunger Games: Mockingjay - Part II. 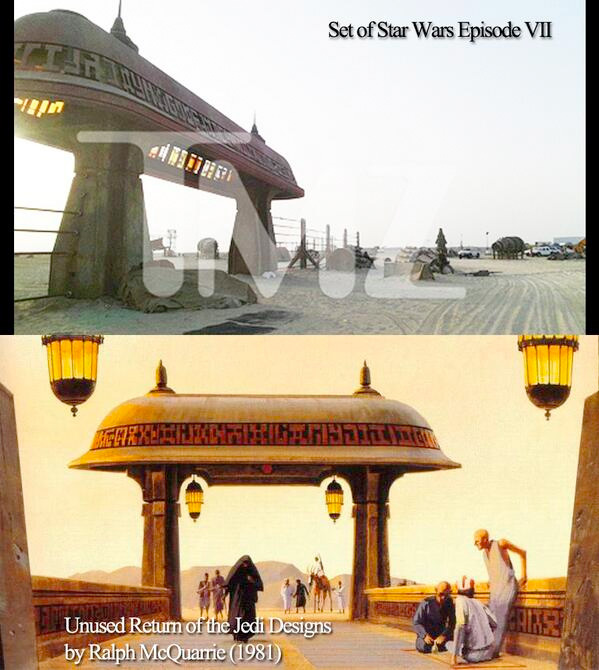 As you can see, that's some unused concept art from Return of the Jedi that has seemingly inspired part of this set in Episode VII. There's not really any hints as to what this location could be other than somewhere on Tatooine, but it could just as easily be another desert area on another planet in the galaxy. You can check out the other set photos, that show off some extras, set pieces and a big pig-looking creature puppeted by men on the inside over at TMZ. As for our two new stars, Kathleen Kennedy says, "“I could not be more excited about Lupita and Gwendoline joining the cast of Episode VII. It’s thrilling to see this extraordinarily talented ensemble taking shape.” They join returning Star Wars actors Harrison Ford, Carrie Fisher, Mark Hamill, Peter Mayhew, Anthony Daniels and Kenny Baker, along with new characters played by John Boyega, Daisy Ridley, Adam Driver, Oscar Isaac, Andy Serkis, Domhnall Gleeson, and Max von Sydow. Stay tuned to see if there are any other roles left to be filled in Star Wars: Episode VII or if any other details from the set happen to emerge. Gwendoline would make an outstanding Jedi. Just awesome. Will her saber be called Oathkeeper? I think it should.